The Fixer Upper program and Berkshire Hathaway HomeServices are teaming up to offer viewers a chance to win a $50,000 “Good to Know” prize package including a consultation from Chip & Joanna Gaines, hosts of the HGTV Fixer Upper series. To enter and for complete details, visit www.50kFixUp.com. We asked our team of amazing agents and employees to share what brings them joy around Thanksgiving. Scott Strevell: I’m thankful for the things you’d expect: good health, a loving family, wonderful friends. Additionally, I’m thankful that my son is settling into his new job in Iowa and thankful that my daughter & future son in-law are successfully finishing up their college education, while juggling the fun challenges of parenthood. Denise Smith: We have a Turkeyshoot Tournament, with many of the extended family at my brother’s farm in Iowa. My sons or husband have claimed first place and taken the trophy home more than anyone else. We will WIN this year too! Sarah Nielsen: My husband handles the turkey. He gets out his surgical gloves, stuffs the turkey, makes some sutures, and carefully carves it as if he were making as series of incisions. Thanksgiving has become the day our kitchen turns into an operating room. Christopher Ojeda: My family! Thanksgiving is not complete without turkey and red wine. Mikki Plaskett: I’m thankful for a wonderful son and that I’ve led a full and exciting life and as I age, I’m healthy and happy. I’m thankful for a wonderful son and that I’ve led a full and exciting life and as I age, I’m healthy and happy. Rebekah Groebe: We take turns telling each other what we’re thankful for. Also, I’m the youngest on my side of the family, so it’s fun to hear stories about my family that I’m either too young to remember or that happened before I was born. Marc Branham: My kids are the coolest! And I always look forward to the food coma. Don and Kathy Mayer: We are thankful for our strong faith, large family and long time friends. Trish Charlons (Kansas City Title): My wonderful but quirky family. Thankful to make the Thanksgiving dressing with my 94 year old grandmother that has to have it just her way, no other will do. Anita Partain: That I come from and belong to such a loving family! Our gathering is very large and we usually take a group walk after dinner. Donna Varady: Having a job and working with an amazing team of people. This is like a second home! Chris Hutchings: I’m thankful for family, the memories made and new memories to come. Oh and the Epic battles at the annual Country Lake Estates Turkey Bowl, North vs the South. Sue Klinksick: My loving family and friends. I always enjoy tasting all of the amazing side dishes and desserts, much better than the turkey. Aaron Olla: My amazing loving wife and 3 perfect children. Michael Armentrout: We spend Thanksgiving at my Grandma’s house in Chicago, eating, watching football, and playing games throughout the day/night, love Thanksgiving! Karen Riley: Perfect health, clear thinking, high energy at 74 years on this planet! Nancy Ann Durrill: Family, Friends & business. It has been a great 32 years with the best Broker in this business. Thanksgiving is always at our Farm with 48 to 55 family members on both sides. 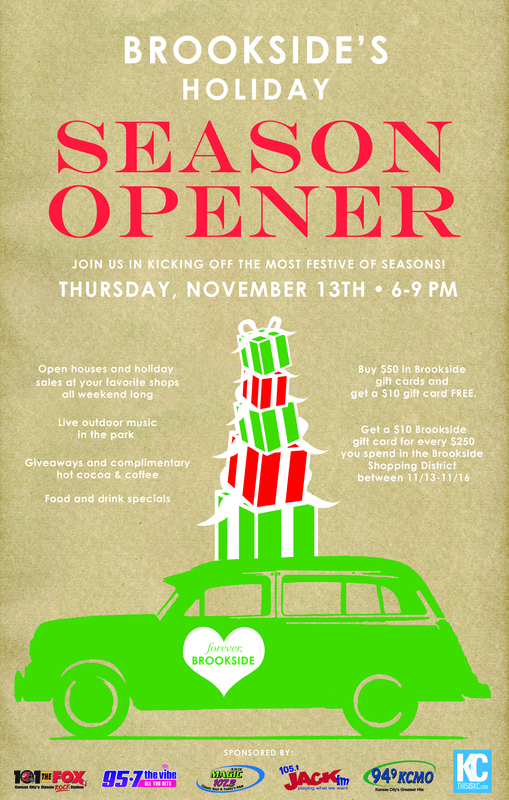 Kansas City, Mo., November 6, 2014 – Kansas City’s favorite neighborhood celebrates the beginning of the 2014 holiday season with open houses, outdoor music, and giveaways, Thursday, November 13th, 6-9PM. Brookside’s Holiday Season Opener kicks off an open house weekend. Participating retailers will be open extended hours November 13-16, Thursday evening until 9PM, Friday and Saturday 10AM-6PM, and Sunday, 12-5PM. Stroll the tree lit sidewalks, sipping hot cocoa provided by Michael Forbes Bar & Grille or complimentary Roasterie coffee and get your first look at the shopping district’s festive window displays and holiday merchandise. Find great deals and the best selection of gifts and seasonal décor at your favorite Brookside merchants. Area restaurants will have food and drink specials available Thursday evening only. The FREE event, sponsored by KC Magazine, 101 the Fox, JACK FM, 94.9KCMO, Magic 107.3, and 95.7 The Vibe, includes outdoor music performed by the Holiday Trombones, St. Teresa’s Academy & Rockhurst Varsity Singers, plus choirs from St. Peter’s School, St. Elizabeth’s School and Border Star Elementary. Two Brookside merchants, United Studios of Self Defense on Brookside Plaza and World’s Window on 63rd Street are collecting new and gently used winter coats and sweaters for both women and children. World’s Window is partnering again for the fifth year with the Rose Brooks Center to help aid their mission to break the cycle of domestic violence. At various locations around Brookside, there will be activities such as live jazz at World’s Window, a whiskey tasting event at The NEW Dime Store, “Forever Brookside” Instagram photo spot at a store named STUFF, plus Thursday Night Football at Charlie Hoopers Bar & Grille. Other participating merchants include: Fit Formula, 5B&Co Candles, Brookside Jewelry, Brookside Toy and Science, Fiddly Fig,Reading Reptile, plus many more. Event attendees can register to win one of three packaged Brookside themed giveaways. Spend $250 and get a $10 BKS gift card FREE. Bring your receipts to Michael Forbes Bar & Grille by 11/16/14 to get your gift certificates. Multiple receipts can be combined to reach the qualifying amounts. Receipts must be dated November 13, 14, 15, 16, 2014 and from a Brookside shopping district merchant. Purchase $50 in Brookside gift cards and get a FREE $10 gift card. For more information, visit BrooksideKC.Org. The Brookside Shops have been fulfilling J.C. Nichols’ vision for the absolute best in neighborhood shopping, dining and services for nearly a century. Generations of Kansas Citians have turned to the Brookside Shopping District to meet their everyday needs along with the extraordinary, too. Located in the area of 63rd Street, between Main Street and Wornall Road, over 80 shops, restaurants, and service providers call this area home. Visit BrooksideKC.ORG, or follow us on Facebook/BrooksideKC, Twitter (@brooksideKCity), and Instagram (brooksidekansascity). 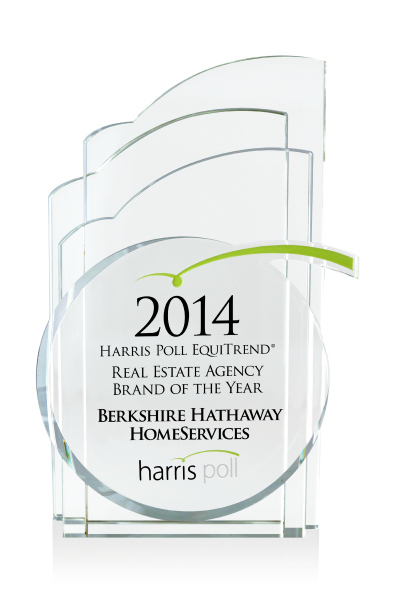 [Leawood, KS] – Berkshire Hathaway HomeServices, the new real estate brokerage network operated by HSF Affiliates LLC, and Kansas City Realty have announced that Berkshire Hathaway HomeServices was recently named “Real Estate Agency Brand of the Year” in the 26th annual Harris Poll EquiTrend® study. Berkshire Hathaway HomeServices Kansas City Realty is a team of extremely strong performers servicing the Kansas City area. Currently operating two locations, led by industry veterans Jim Manning and Stan Klinksick, consisting of nearly 60 sales professionals. 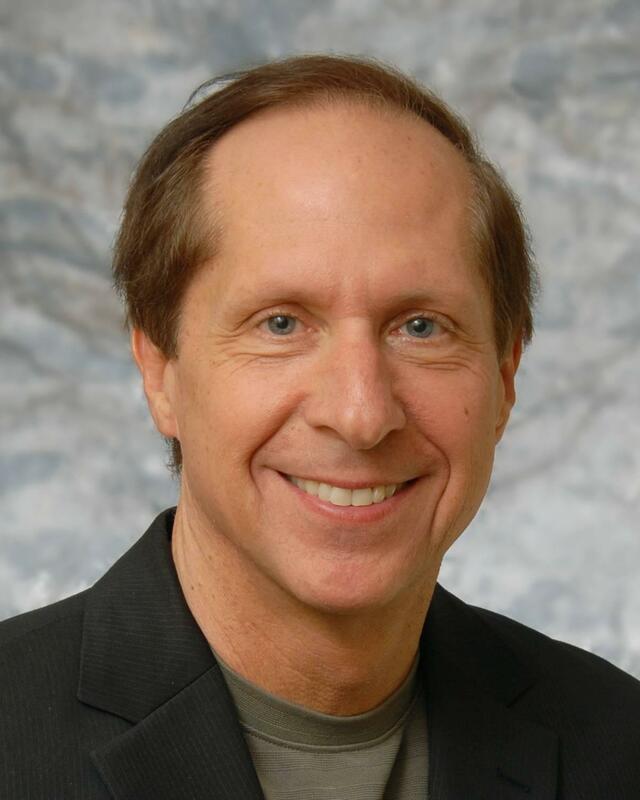 With office locations in southern Johnson Country, Kansas and eastern Jackson Country, Missouri, the team of sale professionals are able to assist buyers and sellers throughout the entire Kansas City metro. The storied Berkshire Hathaway name stands for strength, integrity and financial stability. 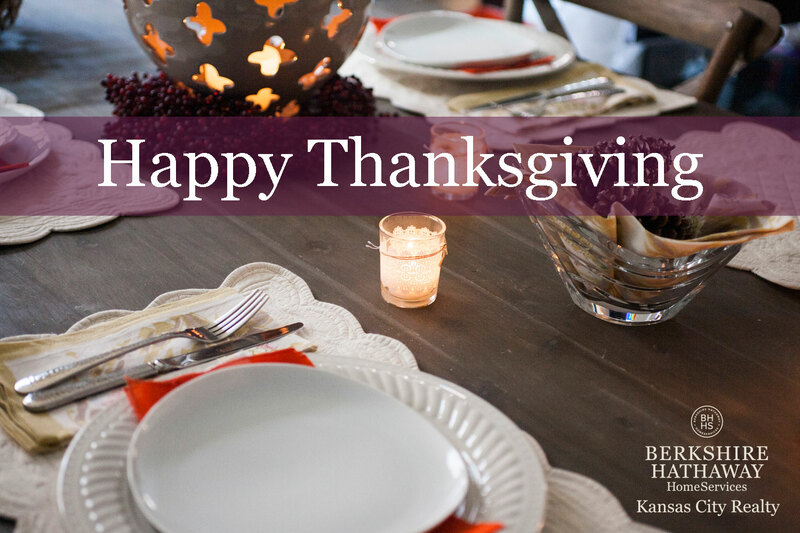 Kansas City Realty harnesses the strength of the Berkshire Hathaway HomeServices brand, the expertise of the team, and the full suite of technology resources to provide buyers and sellers with a unique and custom home buying and selling experience. Berkshire Hathaway HomeServices Kansas City Realty also offers mortgage, title, and warranty services through HomeServices Lending, Kansas City Title, and AB May, Worry Free Home Warranty program. Check out this amazing home designed by Matthew Hufft right here in Kansas City, Mission Hills to be exact. Click Here to view current Mission Hills Homes for Sale!